It's miniature mayhem! Race micro cars, choppers, boats, tanks and formula one! Whiz around the spectacular scale mini tracks. Can you handle sand pits, pool tables and school desk courses? It's excellent! At the title screen, press Up, Down, Left, Right, Left, Button 2, Up, Up, Button 2, Up to activate "Rock hard mode", which causes you car to skid a lot more. On the qualifying race, get well ahead of the pack and then stop just before the finishing line, turn around, and hold button 2 to reverse over the finishing line in first place. A sound will play if you do it right, and you will have a faster car. On the first race ("The Breakfast Bends"), drive off the top right corner of the table backwards. A sound will play if you do it right. This makes your opponents' cars slower. On the first race ("The Breakfast Bends") stop your car at the top left corner of the table and press 1+2. A sound will play if you do it right. This makes your opponents explode when they touch you. On the first race ("The Breakfast Bends"), drive off the bottom right corner of the table forwards. A sound will play if you do it right. This gives you infinite lives - although they don't show they are infinite if you lose that race. In two-player mode, on the pool table tracks, try reversing, or being pushed by a collision, into some of the pockets. Sometimes you can get weird effects, including removing the speed limiter on your car - you just keep accelerating until the game crashes - but in one player the effect is generally bad. 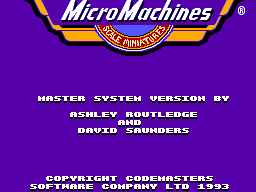 At the title screen, press Up, 2, Down, 2, 2, Left, 2, 2, 2. Start the Breakfast Bends level as usual. When the round starts, turn around and race the lap backwards. When you cross the finish line you will hear a jingle to indicate the code has worked. Whatever happens, you will now finish every race in first place. 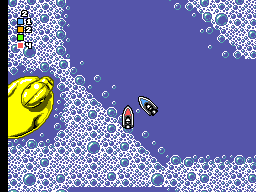 Go to the honey puddle in the center of the table on the "The Breakfast Bends" track and press 1+2. A sound will confirm the code. This will cause your car to skid more (similar to hard mode). 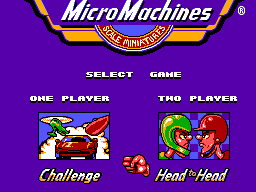 At the title screen, press Up, Down, Left, Right, Left, Button 2, Up to activate "Hard mode", in which your car skids more. Level maps (by Maxim) in .ZIP format. 2.9MB in size.